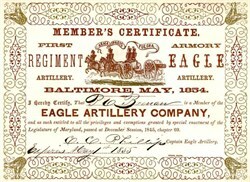 Beautifully printed Eagle Artillery Company Member's Certificate issued to P. C. Brenan in 1855. This historic document was gilded printed by the Young, Print. 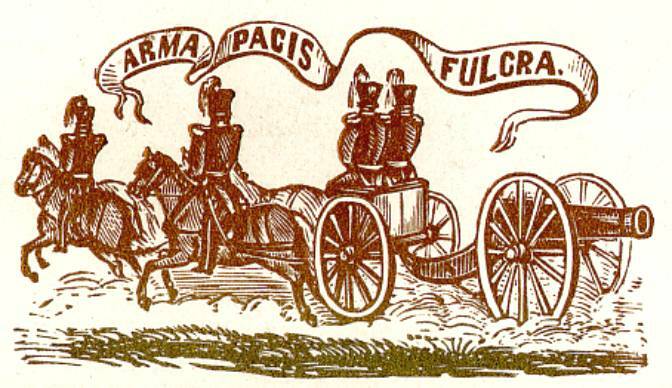 and has an ornate border around it with a vignette of an horse-drawn cannon with their motto, "Arma Pacis Fulca (Armed Strength for Peace)." This item has been signed by the Company�s Captain Eagle Artillery, C.C. Phillips, and is over 156 years old. Excellent condition.